In the UK we do not always get hours and hours of sun. Solar PV is a fantastic way to generate electricity and save money in the process, but what if you could continue to make savings even at night on domestic hot water, swimming pool heating and low temperature heating? 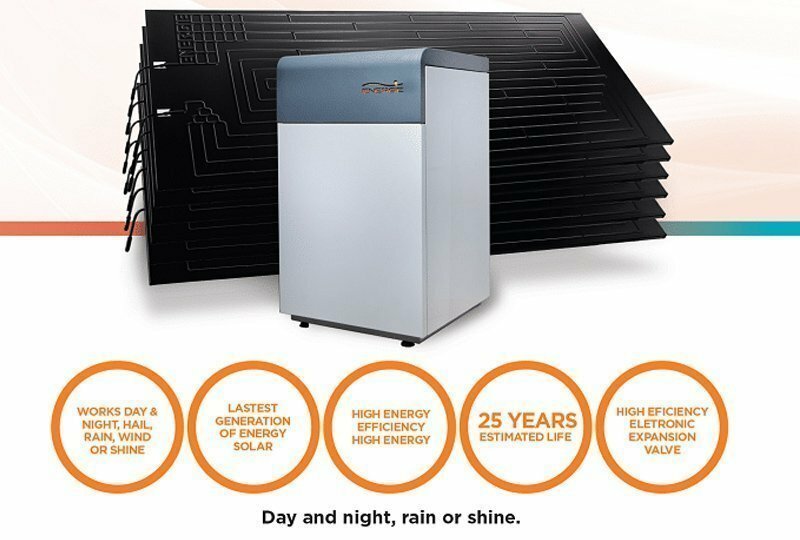 Thermodynamic Solar Heating allows you to collect atmospheric energy from the rain and wind as well as sun, 24 hours a day, 7 days a week, 365 days a year. The highly efficient system which incorporates refrigeration gas can create domestic hot water (DHW) up to 55°degrees and is ideal for a multitude of applications from low temperature central or underfloor heating, sanitary hot water to heating the swimming pool. The sun isn’t always out in the UK. In winter the days have an average of 7 hours of light with only 3 to 4 hours of sun when it does make an appearance, which constitutes a constraint on the operation of traditional solar panels. Thermodynamic Solar Panels work on atmospheric pressure making it possible to raise the temperature of the water with great efficiency and major energy savings on rainy days and even at night. One of the innovative aspects lies in the fact that an ecological fluid (refrigerant) passes through the solar panel at a temperature of -20ºC, thereby allowing the collection of solar energy and greater absorption of atmospheric energy, in other words from the sun, rain and wind, 24 hours a day, 365 days a year. The ecological liquid which circulates on a closed circuit is at a negative temperature when entering through the panel and collects the heat at the solar panels and then with the aid of the compressor to raise the temperature further, releases the heat it into the water via a heat exchanger. SMARTech Renewable Energy have many years experience air conditioning and refrigeration systems, so if you are interested in becoming more self-sustainable, environmentally friendly and save some money, get in touch to find out more.